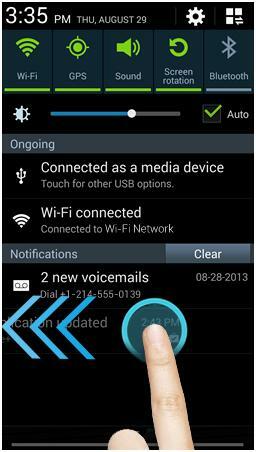 What is the Notification Panel and how do I use it on my Samsung Galaxy Note3? The Notification Panel is a great place to quickly access alerts and shortcuts. 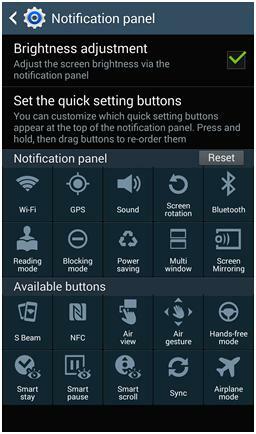 The Notification Panel on your device also provides a quick shortcut to your device's Settings menu. Touch the Settings icon in the top-right corner of the panel. 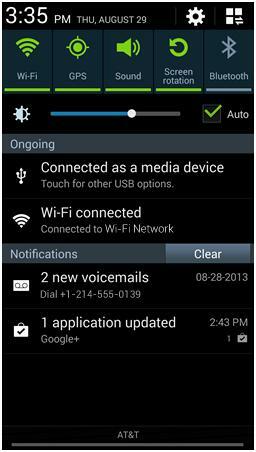 The Notification Panel is at the top of your mobile device's screen. 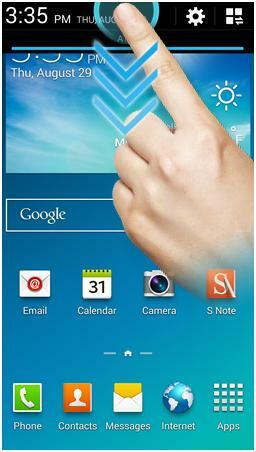 It is hidden in the screen but can be accessed by swiping your finger from the top of the screen to the bottom. It is accessible from any menu or application. You can touch a notification to view additional information, open the related application or interact with features on your device. Touch the Clear button to clear all notifications except the Ongoing notifications. You can clear individual notifications by touching and swiping the notification to the left or right to dismiss it from the list. With expandable notifications, apps can give more information, effortlessly and on demand. 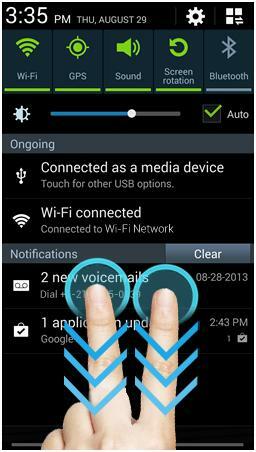 Using two fingers slightly apart, touch and drag the notification to expand it for additional information. To disable further notifications from the app touch and hold the notification. Then touch App info and uncheck the option for Show notifications. Through the Notification Panel you have access to the Quick Panel. The Quick Panel contains shortcuts to several feature settings options so you can quickly turn a setting on or off. When a feature is turned on the icon and the bar below the feature name will turn green. When a feature is turned off these areas are shown in gray. When you open the Notification Panel the first five shortcuts from the Quick Panel are displayed in a bar at the top. You can swipe the bar to the left or right to cycle through the first 10 Quick Panel shortcuts. You can open directly to the Quick Panel. Using two fingers slightly apart swipe from the top of the screen to the bottom. Or you can touch from the Notification Panel to display all of the shortcuts available. 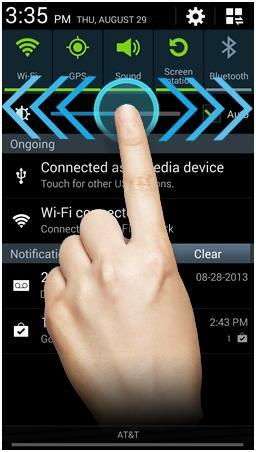 Wi-Fi: Turn your device's Wi-Fi transmitter on or off. GPS: Turn your device's GPS function on or off. Sound: Switch between sound on, vibrate only and mute. Screen rotation: Turn automatic screen rotation on or off. Bluetooth: Turn your device's Bluetooth transmitter on or off. Reading mode: Set your device to adjust the screen for optimized reading. This mode will be activated only for selected applications, such as Google Play Books. Blocking mode: Set your device to block incoming communications. You can adjust the blocking mode settings and add contacts to the allowed list in the blocking mode settings. Power saving: Turn power saving on or off. Multi window: Turn the Multi window feature on or off. Screen Mirroring: Set your device to mirror your screen with supported Smart TVs and other Samsung accessories. 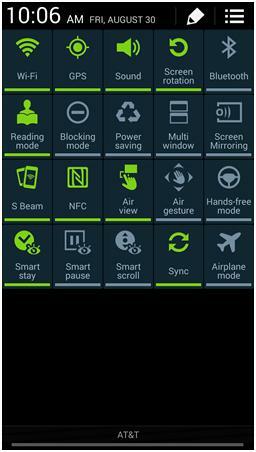 S Beam: Activate the S Beam NFC function. If NFC was turned off then NFC will also be turned on. NFC: Turn your device's NFC (Near Field Communication) transmitter on or off. Air view: Turn Air View on or off. You can adjust the Air View features active in the Air View settings menu. 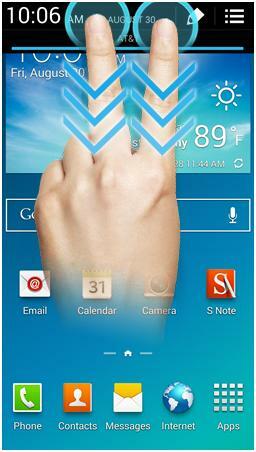 Air gesture: Turn Air Gestures on or off. You can adjust the Air Gestures features active in the Air View settings menu. Hands-free mode: Turn Hands-free mode on or off. Smart stay: Turn Smart Stay on or off. Smart pause: Turn Smart Pause on or off. Smart scroll: Turn Smart Scroll on or off. Sync: Turn all account sync functions on or off. Airplane mode: Turn Airplane mode on or off. When Airplane mode is on all radio transmitters are turned off. From the Quick Panel grid view you can edit how the shortcuts are displayed in the Notification Panel and Quick Panel. Touch . Alternatively, you can access the Notification Panel settings menu from the Home screen. Touch Menu > Settings > Device > Notification panel . To reorder the shortcuts in the Quick Panel touch and hold a shortcut to select it. Drag the shortcut to the new location and release. Touch Reset to return all of the shortcuts to their default locations. Touch Brightness adjustment to mark or unmark the checkbox. When the checkbox is marked the brightness adjustment shortcut will be displayed in the Notification Panel. This feature is turned on by default. You can swipe the brightness bar to the left to decrease the display brightness or to the right to increase the brightness. 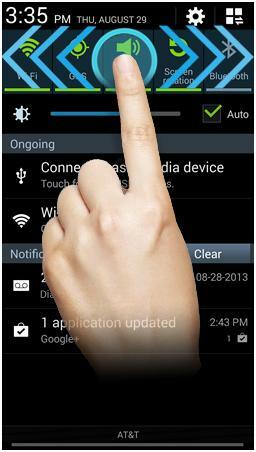 Mark the Auto checkbox to have the brightness controlled automatically using the device's sensors. Galaxy Note3: How to reduce fast data consumption?